It’s easy to get caught up in the excitement and emotion surrounding a first pregnancy. Everything is so fresh and new- so much to learn and to get done. Creating dream baby registries, scouring page after page in baby name books, and scheduling 4-D ultrasounds come naturally and with much due anticipation. Creating a countdown to baby calendar is just one more way to add another level of thrill to the months preceding baby’s birth date. Friends and coworkers, extended family and even friendly acquaintances get excited about that first and even second pregnancy. By the third or fourth pregnancy, the hubbub has died down quite a bit, and it might seem surreal that baby’s even growing inside. A mama friend of mine chatted openly with me about her similar experience, as she neared her second trimester carrying her third little miracle. Now that I’m pregnant too (with my fourth), I can attest to the truth in that statement. 29 weeks with baby #4! In fact, the raw honest reason I made this colorful little calendar was twofold. One: To help my preschoolers grasp the idea of how long until baby arrives. Two: To have a visual aid staring me in the face every day reminding me that… I’M PREGNANT! And that I should therefore remember to hold off on sushi and Thin Mint fudge, drink more water, and sub out 30-Day Shred DVD’s for my favorite prenatal YouTube exercise videos. 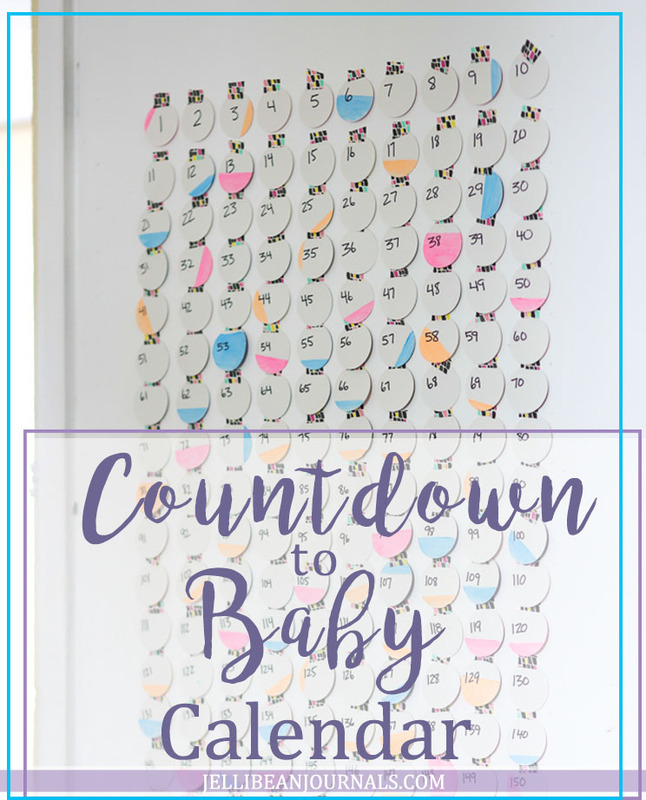 No matter whether you’re 4 weeks in, or 34, creating a countdown to baby calendar is a fun afternoon DIY that really bumps up the excitement factor for a pregnant mama-to-be. It also makes a spectacular baby shower gift! In fact, I was inspired by this video that used a similar calendar baby for baby shower attendees to scribble down tips and encouragement for the new mom. So clever! Let’s make a countdown to baby calendar! Check a pregnancy calculator online to determine how many days until your due date. Find your favorite Netflix program or podcast (you’re gonna be here for awhile!) 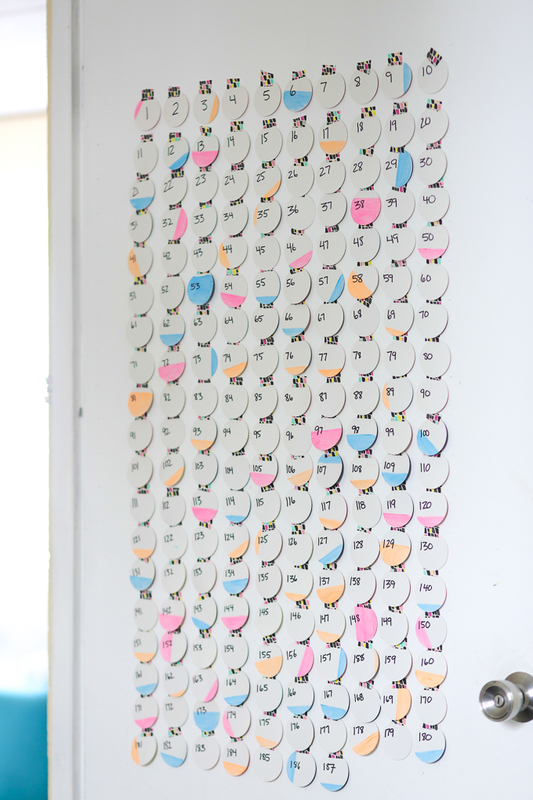 and begin punching out as many circles as you’ve got days until your due date. Scribble a number on each circle with your trusty Sharpie. Paint your circles, if that’s your thing. Determine where you’d like to display your calendar and how many rows/columns you’d like to use. Use a few circles, a ruler and a level to map out your plan. 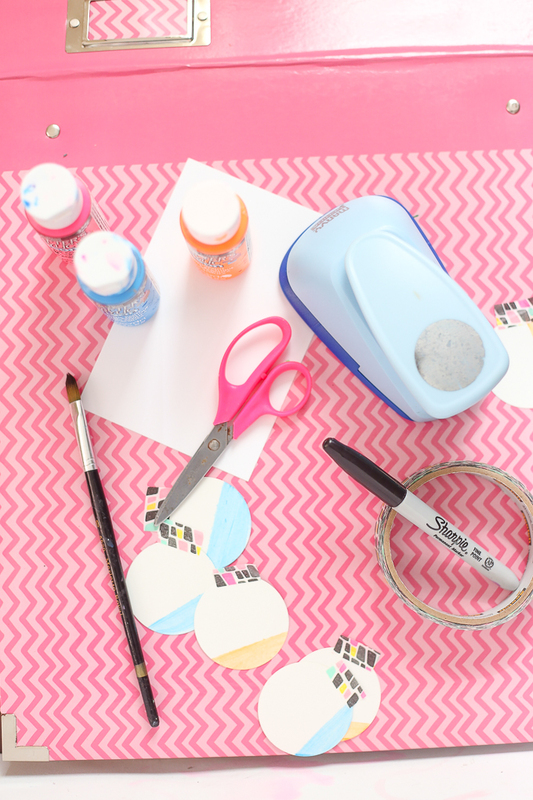 Bust out the washi tape and tape up your DIY countdown to baby calendar. Wow~! You did it!! What are your favorite ways to psych yourself up about meeting your new baby? This is so cute! And it really is a great way to count down for older siblings! Thank you, Chelsea! We had fun with the countdown, but I keep forgetting to take down the days and keep track now that we’re about 8 weeks away from baby’s debut.